A few weeks ago I decided to branch out from experimenting with different breads and try making some pies and quiches. My first attempt was a Leek, Bacon and Sweet Potato Quiche (using up spare/leftover food from the fridge and freezer). The pastry recipe came from the BBC website. I had a look through some of the many recipe books at home and was surprised to find that there wasn't a single quiche recipe in any of them. I found a few recipes online and used them for inspiration. I cooked the leek and bacon, then diced the sweet potato and boiled it in water. 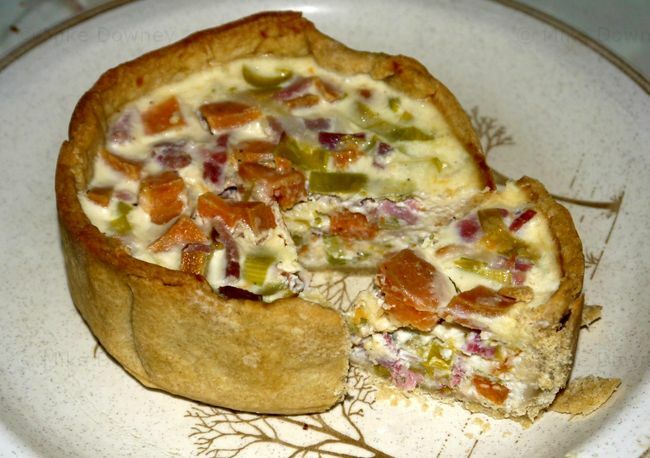 The filling was some milk, egg, grated cheese and a little salt and pepper, beaten together then mixed with the rest of the filling. 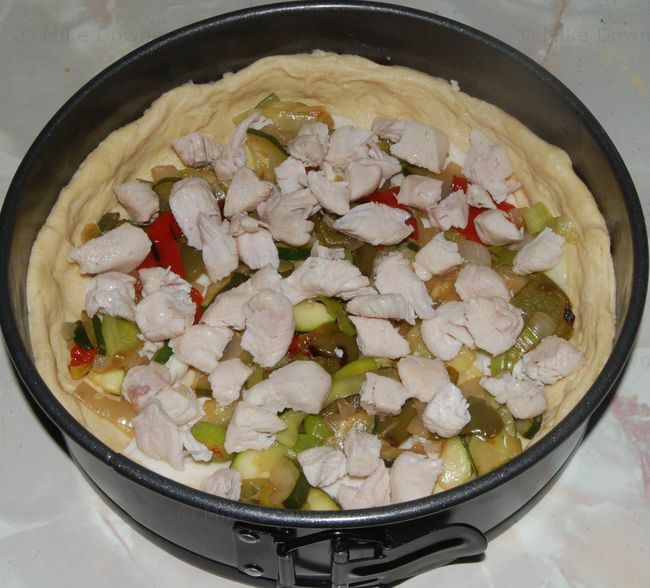 The pastry was baked blind first then the filling was poured in and the quiche was put back in the oven. I still have several tubs of mashed banana in the freezer, from when I bought a bag of over-ripe and/or bruised bananas for 8p a couple of months ago. The sourdough baking booklet has a recipe for banana bread which is made using a sourdough batter with added baking soda for extra rising. I decided to use half the amount of sugar they suggested because I was adding dried fruit instead of chopped nuts and I didn't want the bread to be too sweet. The resulting loaf was good, very similar to the River Cottage recipe I used previously. We regularly buy a ginger and coriander marinated chicken from the supermarket but usually did it with fried rice and had kind of run out ideas for it. I did a bit of googling for recipe ideas and thought I'd have a go at Ginger Peanut Chicken Pasta. I did my usual thing of just reading through the ingredients then making up my own version. I fried an onion and a couple of cloves of garlic, added 1/4 tsp ground ginger and 1 tsp chilli flakes and a splash of lemon juice and soy sauce. I then mixed 1/2 cup of milk with a heaped tablespoon of peanut butter and a teaspoon of cornflour and stirred it to get it as smooth as possible. Meanwhile I cooked the chicken in the oven and boiled a pan of spaghetti. When the chicken was cooked I added the peanut/milk mixture to pan and heated until it had thickened. It worked out quite well. This week's new recipe is yet another from the River Cottage Bread book. I followed their recipe as closely as possible. When it came to making the cross on top, I mixed the flour and water using the given quantities but it was far too runny and impossible to use in the piping bag without it all immediately running out of the nozzle. I mixed in some extra flour to make it a bit thicker and it worker better. 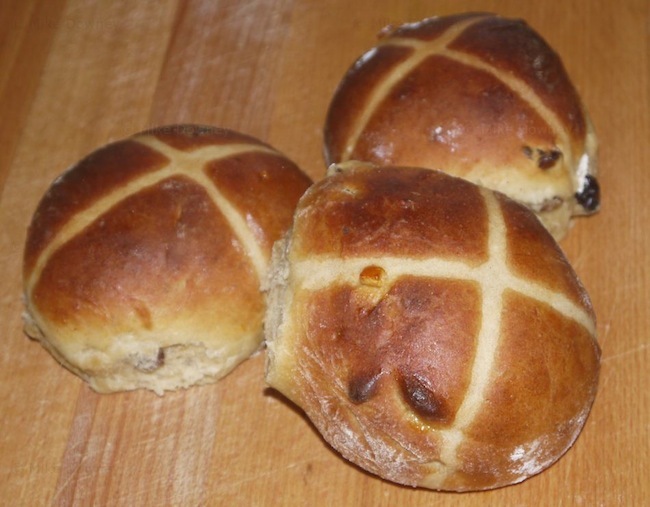 The hot cross buns were very good when eaten fresh. When they were a couple of days old, they had started to go a bit hard and dry and needed to be toasted, but they proved to be very good that way, with a bit of butter melted into them. A couple of quick recipes this week, both coming from the River Cottage books (which I seem to be using rather a lot these days). One was more successful than the other. The first is soda bread. This is incredibly quick and easy to make. I didn't have buttermilk but used watered down full fat milk instead. The great thing about soda bread is that you only knead it for long enough to make sure it is fully mixed together. The resulting bread tasted as good as a bought bread and we ate it within about an hour of starting it, with a bit of butter. The second recipe was scottish oatcakes. Unlike the staffordshire oatcake, which is more like a pancake, these are hard dry biscuits. I made them using a mixture of plain flour, porridge oats and pinhead oatmeal. I didn't follow the recipe exactly and the biscuits came out a bit crumbly so I might try again but follow the original recipe a bit more closely. This week's recipe was inspired by an episode of Man v. Food we watched last week. They were in Chicago and ate a traditional deep pan pizza. We decided to try one as part of our traditional weekly pizza night. 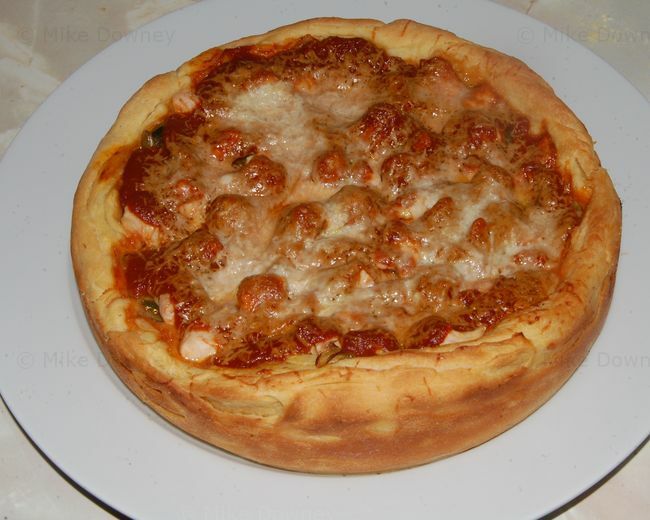 We started off with our normal pizza base recipe, using ¾ bread flour and ¼ yellow cornmeal. 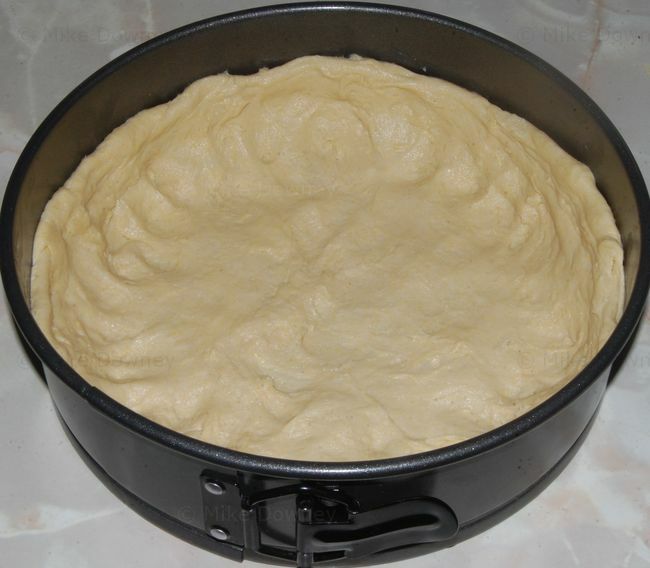 The dough was made in the usual manner and allowed to at least double in size. I then flattened it out, spread it with butter then folded it over a few times. 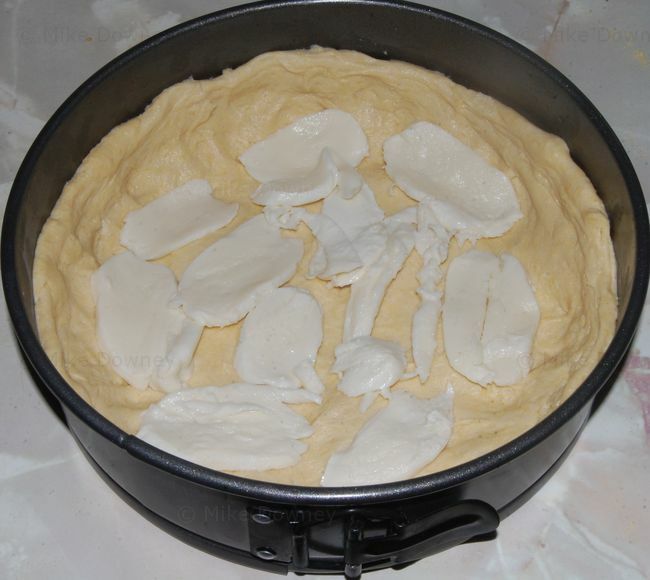 I put the base in a 9 inch cake tin and pressed it into the edges and about an inch up the side. 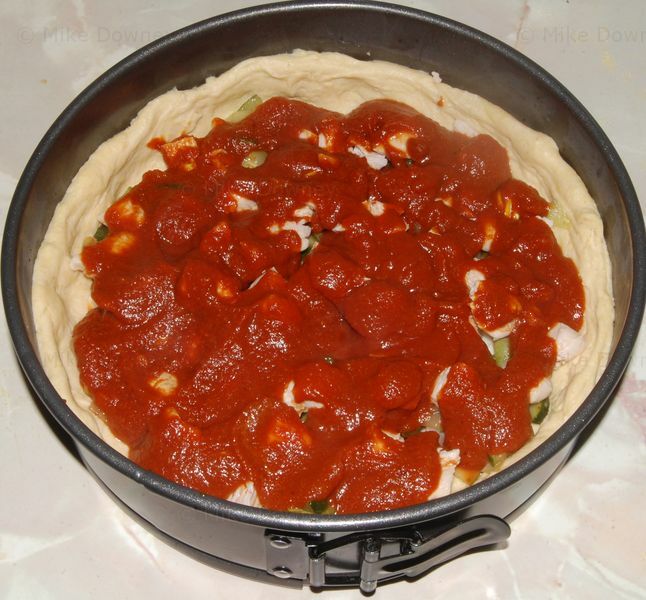 One of the things mentioned in Man v. Food was that the deep pan pizzas are made upside down. The first thing on the base is the cheese. Here I used sliced mozarella. The next things to go on were fried vegetables and cooked chicken. The veg were: roasted red and green peppers, diced and fried onion, leek and courgette. The sauce then goes on top. I used a spicy tomato sauce which was based on the one from the Mexican Lasagne. I simmered a pan of passata and added crushed garlic, chilli flakes, cumin, paprika, salt, sugar and balsamic vinegar. The pizza was nearly finished. 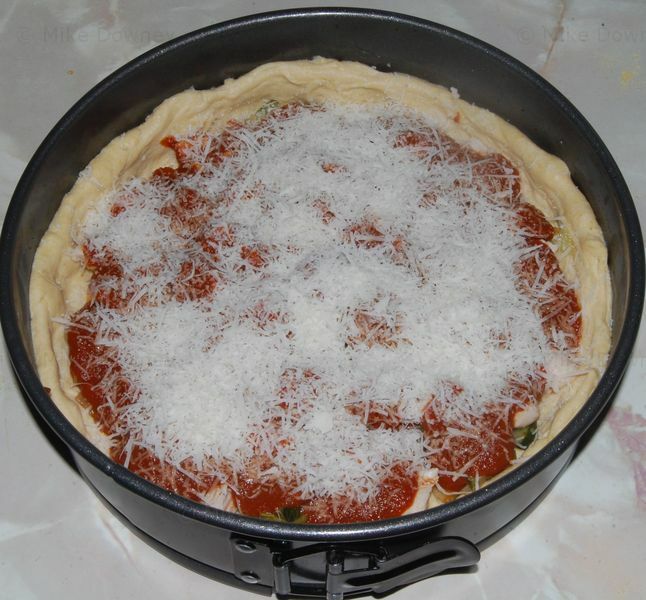 I topped it with grated pecorino cheese then baked it in the oven, at gas mark 7, for about 20 minutes. The pizza was full of flavour and unlike anything you normally get from a take-away or supermarket. It is definitely something worth doing again. The base would work well as a kind of 'tear and share', especially if made with garlic butter or a similar flavoured butter, possibly with grated cheese or diced mozzarella folded in too.